For the first time, over 50% of seniors are online and using the internet. 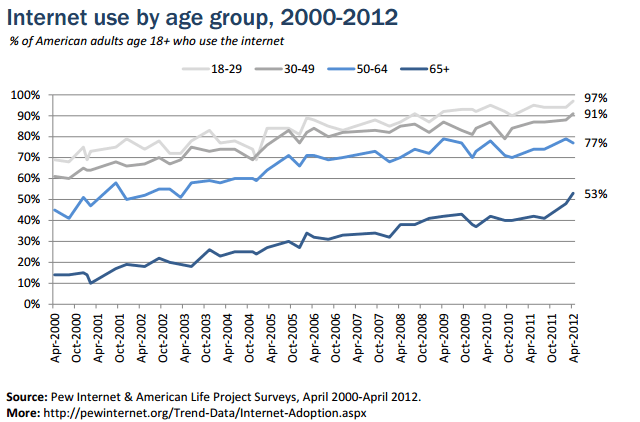 This is dramatic growth, as there were barely 33% of seniors using the internet in February of 2011. No other age group increased the level of usage as dramatically as those over age 65 have in the past year. And, once online, seniors use the internet as a regular part of their life; 82% of them using the internet on a regular basis and 67% using the internet daily. While they use email regularly, 33% are either on Facebook or Linkedin as part of their normal routine. So, why is this important to you, someone who sells insurance for a living? Seniors will be doing more and more searching, buying and managing their insurance online – rather than face to face or even over the phone. They are going to be increasingly comfortable with technologies like screen sharing, online quoting and even online purchasing of insurance. And you will see more service requests coming from email, your website or your social networking. More and more of your sales leads will be coming from the internet rather than other sources like direct mail and telemarketing. What Are You Doing to Be More Web Friendly? All of this means you need to make sure you are equipped to deal with a growing senior market who already are online and will be increasing their online presence every year into the foreseeable future. If you don’t have your own website – get one! Its cheap and easy. If you don’t have an email with your domain on it – get one! Again, its cheap and easy. Look into online quoting tools – I get that you would prefer not to do this, but its what your customers expect – demand. Fighting it doesn’t serve your cause.